The Remind Me Later functionality within iOS 6 is a great addition, but the only problem is this feature is limited to Calls and FaceTimes. Wouldn’t it be great if you could use the Remind Me Later functionality into other areas of iOS such as Mail, Safari, Messages and Lockscreen notifications? Well, thanks to the power of Jailbreaking now you can have the powerful Remind Me Later feature on almost all the stock iOS applications. 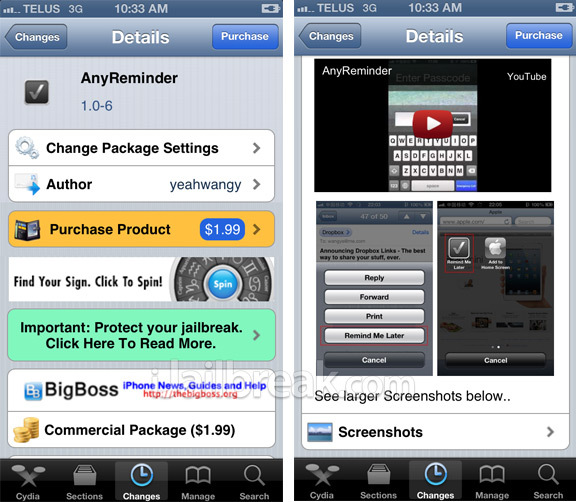 If you are someone who forgets to respond to a text message or email then you need to try out the AnyReminder Cydia tweak. Two options for “Later”:In 1 hour or When I leave (location based reminders requires iPhone 4S and newer). Quick action in Reminders(tap the title of reminder to quickly open web sites or text someone). Store message content or notification content in reminder’s notes. Dismiss a notification on lock screen. Dim screen when dismiss notification. Activate “Clear Notifications” button using Camera Grabber. As you can see AnyReminder is a powerful Cydia tweak that can make you more productive. If you are interested in AnyReminder you can find it on the BigBoss repo for a price of $1.99. Let us know your thoughts on the tweak in the comments section. Great tweak. The developer always creates awesome tweaks. You can tell he cares about practical and productive side of iPhone. He does not waste time on pretty looking things. Id like to see this feature added to twitter/ tweetbot. I hate having to favorite everything to go back and read.